As cities across Quebec, Ontario and the Maritimes continue to grapple with the effects of heavy rainfall and severe flooding over the past week, several municipalities have released helpful maps detailing road closures, water levels and relief efforts to help residents navigate the emergency. One of the hardest-hit areas affected by the heavy rainfall over the last week was the City of Gatineau, Que., near the border of Ontario. On Monday and Tuesday, the city closed government offices, schools, daycares and service centres because of the flooding. As the situation has improved, the city has set to work implementing a recovery plan, which is detailed on their website. Gatineau’s official website also released a map showing which streets were affected by flooding that’s being updated in real time. Despite water levels coming down, the city has kept a number of streets closed in flooded areas and warned drivers to avoid these areas. Trouble seeing the map? Click here to open in a new tab.. According to the City of Ottawa, the main areas experiencing flooding in the city are Cumberland, Constance Bay, Fitzroy Harbour, Dunrobin, MacLarens Landing and Britannia. According to an update posted to the city’s website on Tuesday evening, approximately 300 properties have been impacted by the flooding. The city has set up four emergency community support centres, which will be open from 10 a.m. to 6 p.m. on Thursday and Friday to help residents with any questions they may have. Ottawa provided a map showing where water levels are rising to caution pedestrians and cyclists from going near those areas. Ottawa also included another map displaying locations where residents can get sandbags.The city is asking residents to leave sandbags already in position in place in anticipation of the rain expected on the weekend. For residents concerned about how flooding could impact driving around the city, Ottawa also has an interactive traffic map that motorists can check by clicking on the “incidents” box in the legend. On Sunday, the City of Montreal became the latest city in Quebec to declare a state of emergency. City officials met on Tuesday and voted to extend the state of emergency for another five days. The hardest-hit areas covered under the state of emergency are Pierrefonds-Roxboro, Ahuntsic-Cartierville, Île Bizard-Saint-Genevieve, Sainte-Anne-de-Bellevue and Senneville. As of Thursday morning, the city said a total of 243 homes were evacuated due to flooding. In an update on Thursday morning, Montreal said the city’s tap water was still of “excellent quality” in the flooded areas if it’s supplied by the municipal water system and not an individual well. To help those forced to evacuate their homes because of the flooding, Montreal has set up a number of emergency shelters and reception centres in different regions of the city. The City of Montreal has also created an interactive map showing road closures, emergency shelters and available parking lots for residents to park their cars, which was posted to its website on Wednesday morning. 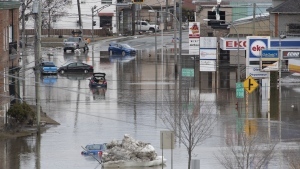 According to a police release on Wednesday morning, in the City of Laval, just north of Montreal, there have been 176 evacuations, water impacting 339 homes, and 160 streets with flooded land. Like Montreal, Laval has also declared a state of emergency for several parts of the city including, Laval-West, Sainte-Rose, Laval-sur-le-Lac and Fabreville. Laval also created a map showing which roads were impacted by the flooding as of Tuesday evening to help motorists navigate around the city. The city has also established two emergency shelters, shown below, which include beds, showers, plumbing facilities and other conveniences. Despite heavy rainfall over the weekend, which caused the St. John River to reach its highest water levels this spring, New Brunswick has avoided the severe flooding affecting parts of Quebec and Ontario. The province released an update on its website on Wednesday saying that Environment and Climate Change Canada is forecasting less than 5 mm of rain in the next 24 hours. They reminded residents to stay away from fast-moving waterways and to avoid driving on water-covered roads, especially those along the lower part of the St. John River basin. New Brunswick said several roads between Fredericton and Gagetown have been reopened. For a full list of road closures, the province provided a list online. The province also has an up-to-date interactive map with current flood alerts and forecasted ones for the next two days.